The more things change, etc. I get really irritated with people who say in speeches that immigrants to the US should “speak American.” For one thing, “American” isn’t a language, it’s a nationality. For another thing, this attitude is as old as this country. Already during the colonial period, even up until the time of the Revolution (1776–1783), English-speaking colonists were afraid that English would die out as the majority language in America. And, no, it wasn’t Spanish they were afraid of—it was German! Well, even though Britain claimed east-coast America as “crown colonies,” immigrants from different parts of Europe also settled here during the 1600s and 1700s. German immigrants were settling in America for almost as long as British. 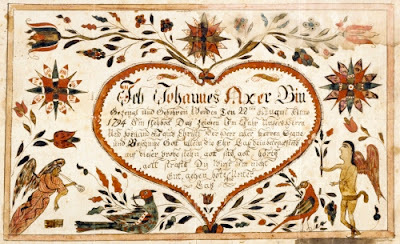 Let’s celebrate German American Heritage Month by showing early examples of German American art! War and religious persecution of Lutherans by Roman Catholic nations were the main reasons for the German migrations to America in the 1600s and 1700s. William Penn (died 1718), who “acquired” the Pennsylvania colony in 1681, was the first to offer the colony as refuge for German Protestants. The first immigrants landed in Philadelphia in 1683, with another large wave of migrations in 1710. By 1717 the German population of Pennsylvania was 20,000, and by 1740 it had doubled. Ben Franklin recorded that there were 100,000 Germans in the colony in 1766. Unfortunately, through the 1700s, many of the German immigrants were too poor to afford ship passage to the US and were forced to sign agreements (in English), to work off their fare as indentured servants once they arrived here. The migrants were from every conceivable sector of German culture: farmers, day laborers, craftspeople, stone masons, and builders. It is little wonder why there is such a variety of artwork left by these zealous, hard-working colonists. By the late 1700s, German migrants could be found in Maine and New York up to Buffalo. Settlements grew throughout Pennsylvania (Philadelphia and Pittsburgh), into the Ohio Valley, and down to Tennessee and Kentucky. Germans had settled in most of Maryland, especially Baltimore, down along the Shenandoah Valley, through North and South Carolina, and on into Georgia. As the west opened, settlements grew in Missouri and Wisconsin. Much of the art of Pennsylvania German artists reflects a self-taught aesthetic. The decorative motifs such as flattened birds and flowers come from textile designs. The majority of painting in watercolor is in the form of decorated documents, such as this birth certificate and baptismal record. Though few “portraits” exist in the 1700s, by the early 1800s naively drawn “portraits” appear more and more in these documents, where the text takes a back seat to the standing couple. Note that by the 1850s, these descendants of the German immigrants are writing their documents in English. The stylized, flattened flowers and quilt-derived sunburst designs are giveaways that this Musser family is Pennsylvania German. This dish was made from high-quality clay found under the wet topsoil of Pennsylvania's low-lying plains. Southeastern Pennsylvania's terrain supported farms and potteries, so by 1810 ceramics kilns could be found in almost every township in Buck's County. 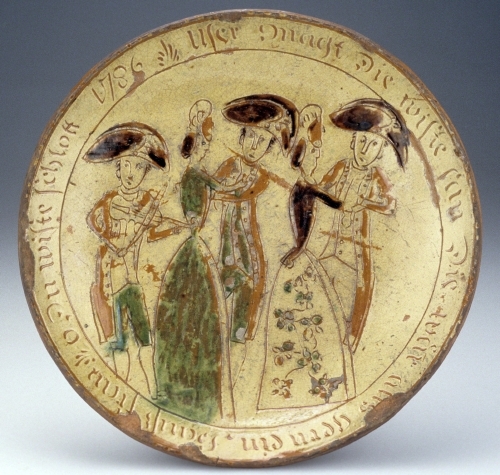 Besides producing ceramics on the wheel, Pennsylvania German potters adapted the British technique of making plates such as this by draping a damp slab of clay over a convex mold to form the plate. The inscription on this plate (which I absolutely cannot read) and some of the outlines and coats of the musicians is done in sgraffito work, incised lines that reveal the red of the clay underneath. Another prevalent art form among the Pennsylvania German was furniture. Because many of the German immigrants were not affluent, their furniture reflects the lives of less well-off people back in Germany. 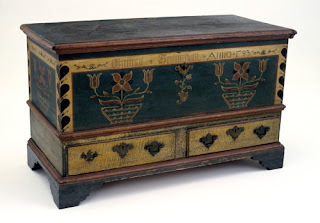 For working class people, chests such as this were essential, and often the only type of furniture they owned. Chests indeed sometimes doubled as beds. This is a custom that dates back to the Middle Ages in Europe (ca. 1000–1400). 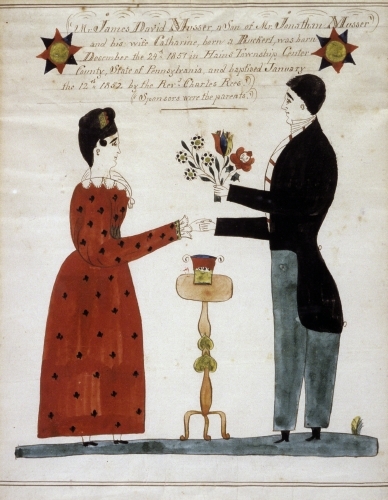 Typically, Pennsylvania German furniture was painted, because the German immigrants could not afford furniture with expensive inlaid wood decoration (marquetry), or veneered furniture. The stylized flowers are similar to those seen in the two watercolors.